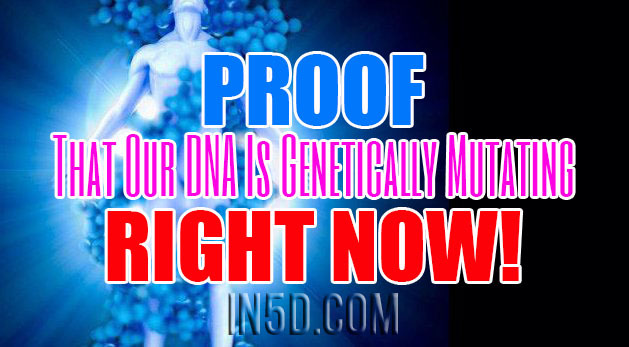 Proof That Our DNA Is Genetically Mutating RIGHT NOW! So I choose to share a private sensitive issue so that it may assist others that may be going through anything similar. My hope it will bring clarity for everyone. I had a test done that showed that the cell structure of the mitochondria is not working properly and has changed. This also includes the DNA and RNA have changed on a cellular level. This creates many underlying issues physically with the parasympathetic nervous system, vascular system, muscles, lymphatic systems, sympathetic nervous system, thyroid issues issues with all forms of digestion issues, cell structures and cell protoplasma properties, restoring energy levels, endocrine system, cardiovascular system just to name a few things that it affects. In layman terms, it means chronic fatigue with extreme weakness, organ weakness, along with muscular and joint pain. So, a couple days after understanding this, I did my prayers of gratitude with morning sunrise and I asked source, spirit to bring me guidance as to what was happening. Now that the physical was documented, I needed documentation from spirit as to if I was broken or was this evolutionary changes taking place? You are seeing evidence of physical changes on a cellular level. You are experiencing genetic mutation and alteration that has been taken place for many years in your level of awareness. It comes from the ultraviolet radiation and wave forms of photonic light from the sun. Allow it to be a understanding that you are changing from what you once were into your new future self. Everything is occurring in divine order. It is only your resistance that creates discomfort. You must get deep rest as your physical is under direct stressors. You will also be making more space on a physical level to capture and hold a higher content of wave form. Do not judge the next step of your journey as it may appear as illnesses, but know it is stepping into another level of transformation. Because your mind cannot comprehend what is occurring with the physical, just allow and trust the process of evolution. What appears as that of non-beneficial from your level of awareness is necessary for your greatest transformation. Seek to lift immortal illusions and reconnect with the power of the original intent of source for your eternal journey into greater purpose and destiny. Tags: Proof That Our DNA Is Genetically Mutating RIGHT NOW!